Always I look at each newly discovered axe, wondering where it had been and what it had done in times when so much was gained & lost in the clash of cultures. It is those stories that we really collect. Tomahawks are among the tools of those enthralling slices of history, hopefully imparting the faintest pulse of the past to those of us few who hold them. In as much as is possible, we are collecting history itself, temporary caretakers for the next generations. 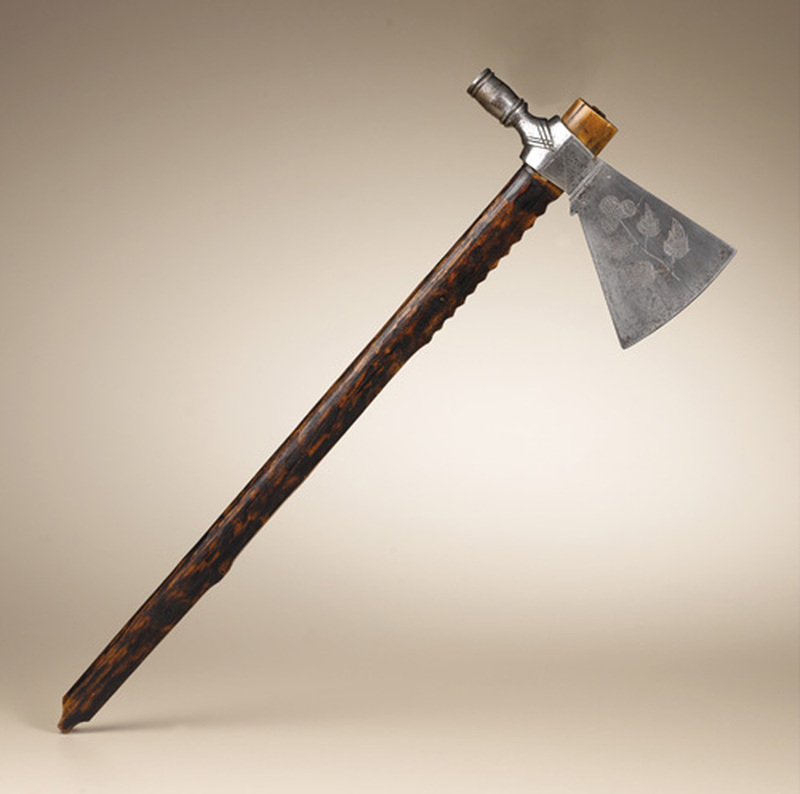 Welcome to the Fur Trade Axes & Tomahawks new & improved website. My name is Mark Miller and I have been collecting tomahawks/trade axes for about 23 years, antique axes for 32 years and currently a professional tomahawk authenticator. 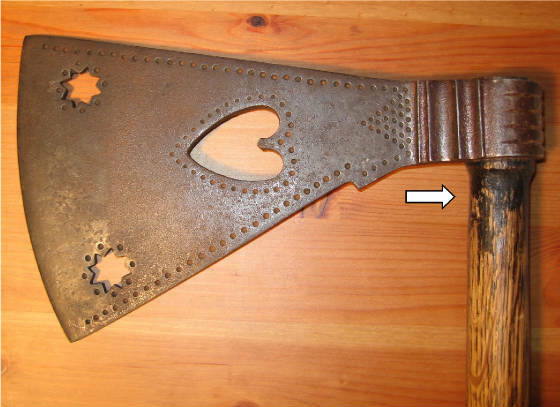 For years, on & off, I have been researching the tomahawk/trade axe markings and their makers. To date I have recorded about 2,000 names and marks of blacksmiths who made these, most of whom have not been published. 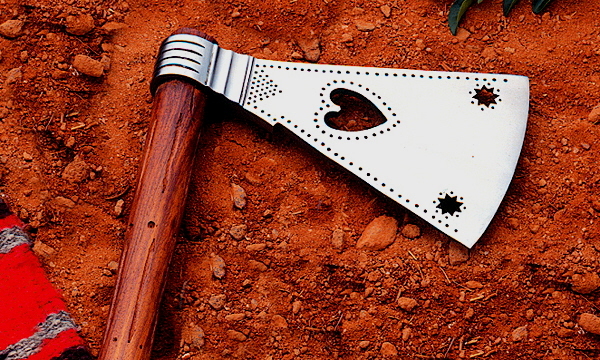 After my Ebay Guide drew so much attention & some friends encouraged me to begin this website, I've decided to try to teach & encourage others who are thinking of collecting tomahawks and related axes. Having also collected other antique axes & tools of all types for much of my life also perhaps gives me a unique perspective into various other types of axes that have been confused with the fur trade axes. I also enjoy collecting other items of fur trade collectibles which has helped me distinguish certain features in the tomahawk category as well. There are many, many outright fakes and honest reproductions whom sellers claim to be authentic which were made from the time that originals were to the present day. Of the Ebay tomahawks being sold as authentic at any one time, a 'misidentification' rate of 99% or more is not unusual. Not all of these sellers are dishonest people. With one antique dealer I asked if he was absolutely sure that his tomahawk was an authentic original period piece from the early 1700's and unhesitatingly he said that yes it sure was! Then I showed him the website with the identical trade mark of a reproduction maker who had been making those for 35 years. To his credit he quickly removed the item for sale but these were experienced antique dealers who sold for decades & who were unable to distinguish a 30 year old tomahawk from a 300 year old one. Its tough sometimes. There are no classes or educational requirements for antique dealers & it is a daunting challenge for anyone. Just like their customers, some are more diligent than others when it comes to identifying & dating antiques. This site is intended to help separate the misinformation from the facts & give collectors a better sense of what to look for. Much of this information concerning what to look for is not published & collecting tomahawks IS a competitive sport so there isn't much incentive to share. Certainly we don't want to divulge too much to the fakers who want to learn to fake them better! Too much money has been wasted on junk while authentic ones go unnoticed so I'd like to begin trying to change that. After reading this website many of you may discover that tomahawks are not nearly as common as you once thought, but when you do find the real thing it will feel truly that much more gratifying. I will be adding text and photos as time permits so check back again from time to time. I will try not to repeat the information contained in my eBay Guide so please see:Trade Axes & Tomahawks--Authentic or Reproduction? In the spirit of Native American culture, I hope collectors will also look beyond their material objects and more into the religious and symbolic meanings of these objects as well. In European thinking, we can get bogged down in the mundane physical minutiae of these objects & lose sight of the history we craved in the beginning of our collecting hobby. So much of what we have been taught has been misinformation. From authors Longfellow, James Fenimore Cooper and George Catlin there was created the fearless and enigmatic 'noble savage' for Eastern readers thirsty for Western adventure to devour. http://en.wikipedia.org/wiki/Noble_savage Early descriptions of mindless, marauding, blood thirsty, tools of the devil were also portrayed by the media of their day. The truth is more often in the middle of those extremes, but like any race, both good and bad existed in the context of their cultures & times. Even in today's media they are portrayed in movies as having supernatural powers and able to mysteriously shape shift into living animals at will. Some myths die hard & Hollywood doesn't help. It is well worth discovering who the authentic North American Indian of history actually was ...and is. I will be sharing some photos of my collection as well as from other collectors & museums. To those new to collecting I recommend reading first my pages on fakes pg. 17-20 & pg.30. Originally (early 1600's Jamestown era) the Algonquin term 'tӓmӓhâk' used by the local Virginia Algonquian Indians, & a similar name by the Renape, referred to virtually ANY stone cutting implement or wooden war club referring to a head breaker--or at least according to the colonists of the time. 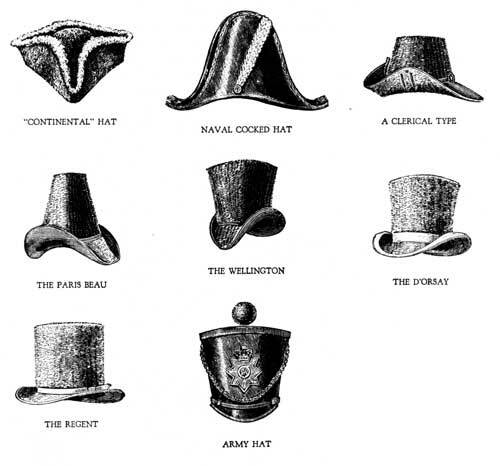 The French and those allied with them called them "casse-têtes". Then when Europeans began trading the iron hatchets the English corrupted version of the term tomahawk grew to apply only to iron axes traded to Indians in Virginia in the 1620's. This is an oversimplification of the origin and definition however early translations, dialects, nuances and tribes have broadened the definitions to ridiculousness. We are probably never going to know the precise origins/definitions from each tribe from the earliest point of European contact. Linguistics did not exist at the time and translators didn't always precisely interpret the meaning correctly of some words. As time went on the differentiation & also confusion between tomahawks and every other axe/hatchet/war club, etc. expanded, much to the chagrin of researchers. 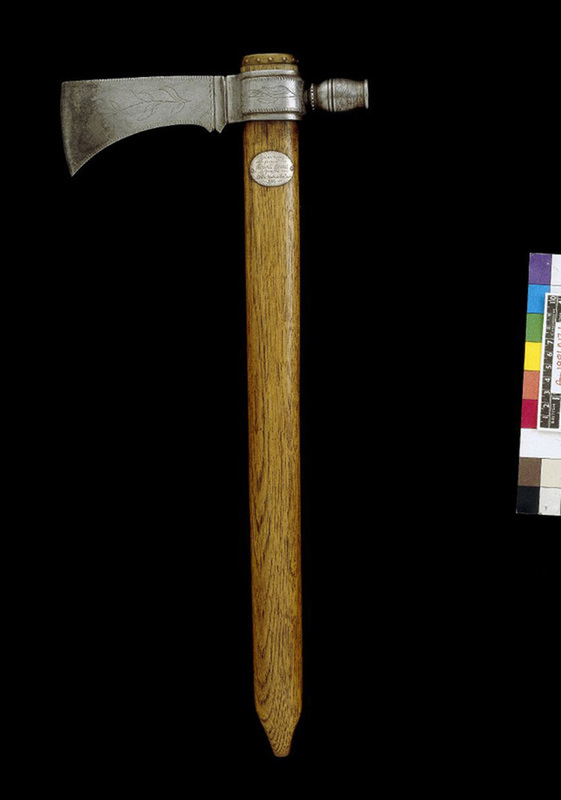 Today most collectors and museums refer to stone tomahawks as simply 'stone axes' although at the time some early writers claim it was also considered a tomahawk. What this website will be dealing with will be the metallic axes that were traded with the native Americans as well as trappers, hunters and explorers during the fur trade era of contact. Besides Native Americans, men such as explorers, trappers, traders, hunters, riflemen and even Revolutionary War & War of 1812 soldiers carried tomahawks. Some used belt axes (smaller trade axes) with just the hatchet blade to carry on their side or back which was used as a weapon & as a tool for sectioning a large animal or making kindling to get a fire going etc. In the West they used Missouri War axes which were large thin bladed round polled axes which were 7-10" long and often used on horseback. 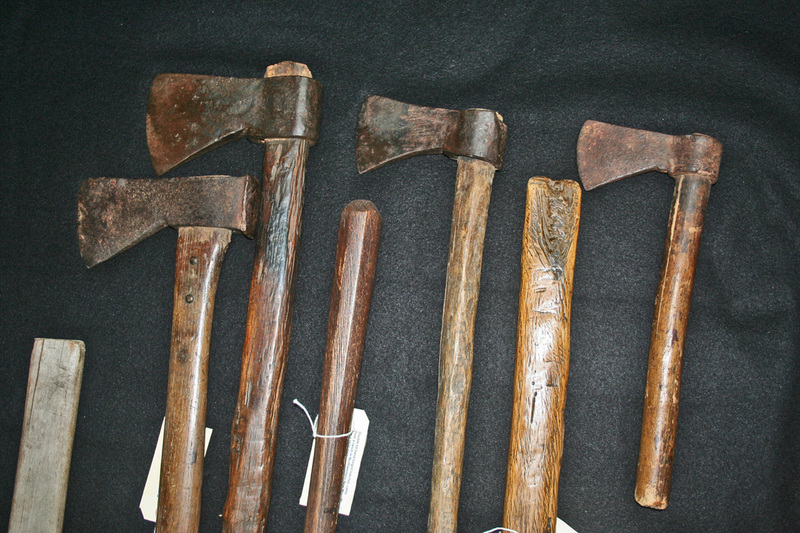 Axes were traded almost from the first European contact period until the early 20th C. In the 20th C. they were obviously no longer used in as weapons but as symbolic items used in dances by that time or as tourist souveneirs, although the pipe tomahawks still portrayed great prestige among their owners. Pipe tomahawks were used by Eastern and Western Native Americans, white frontiersmen, & all were highly valued. They smoked it like a pipe with the handle being hollow & on the other side was a blade. The blade was used for chopping wood, as a weapon, or just symbolic and not used as either. The smoking of the pipe was a sacred practice having special meaning to Indians & probably the most important part of the pipe tomahawk. Native Americans believe that the pipe itself has both spiritual powers and actual powers but when the tomahawk was combined with the pipe that meaning took on even greater power to them of both war or peace. 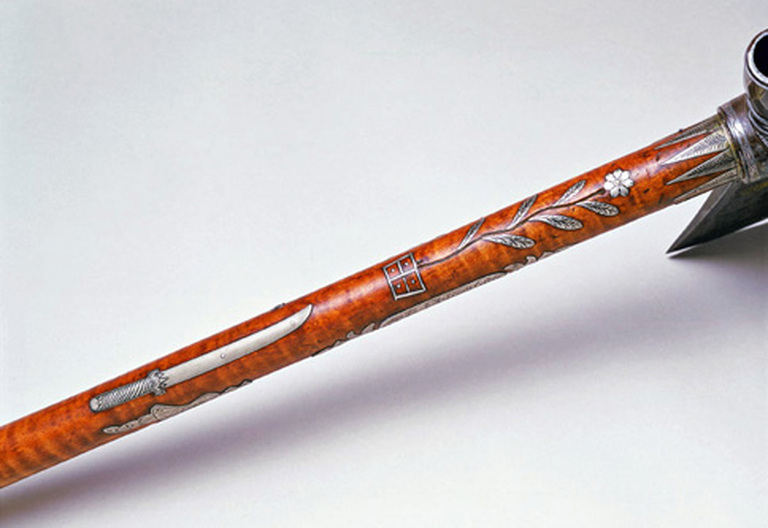 So many photographs were taken of them smoking pipes at treaty signings that whites interpreted them as "peace" pipes. Really it was a sacred way of initiating a connection with the Creator to the spoken words that took place in a ceremony. It was central to any great decision & to them the signing of papers meant little compared to this ceremony. Eastern Native Americans were quite adept at throwing tomahawks from an early time and practiced wrestling with them and knives to hone their skills. I've read one account where they were typically thrown at 50-70 feet with unerring accuracy. Another account of a man being chased (who later became a governor) was described as being hit in the back by the pipe end of a thrown pipe tomahawk while on the run, indicating they were not always on target. Many of the tomahawks were made in Europe such as England, France, Russia & Utrecht, Holland to be imported to North America. Many others were made by blacksmiths that were either independent or those hired by the government to satisfy treaties and to entice Native Americans to ally themselves to their side. 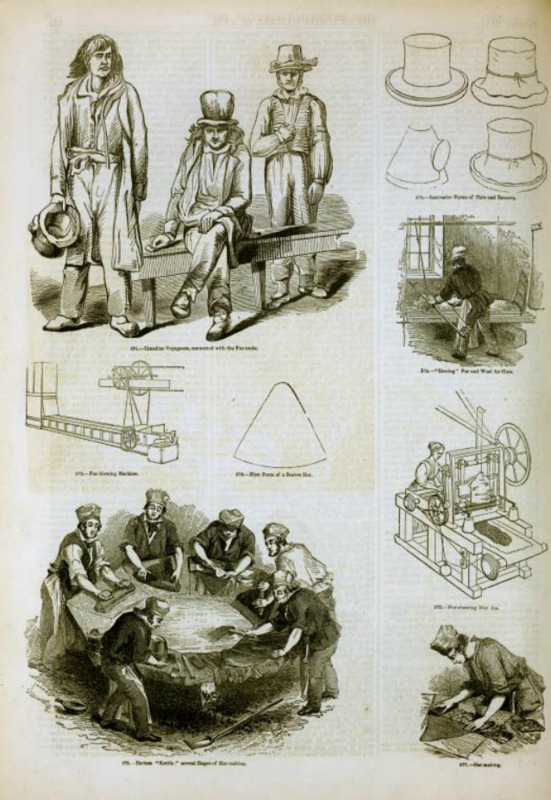 To a lesser extent there were also some Indians who did blacksmithing for themselves, more often the pewter and brass ones although some did it in iron. No website can be a substitute for conscientious research of publications and hands-on study of a wide range of specimens as well as listening to those whom are more experienced. Hopefully this website will encourage readers to learn more rather than allow this to be the extent of their education on tomahawks. Frankly we know so little about these objects that much of what we do know has to be drawn from clues here and there from records & the objects themselves. Fur traders were in business so we know far more about their prices than we do about the specific variations of tomahawks & why they were preferred. With so many reproductions, deliberate fakes and wannabe experts out there it makes learning much more challenging. It requires a great sagacity and unbiased, dispassionate judgement based on experience & knowledge of both the originals and the fakes. Much of a tomahawk's value is centered on it's 'degree of authenticity', as I like to call it--meaning the amount of doubt, or lack of doubt, concerning the identification of a particular tomahawk as an original genuine artifact by all concerned. 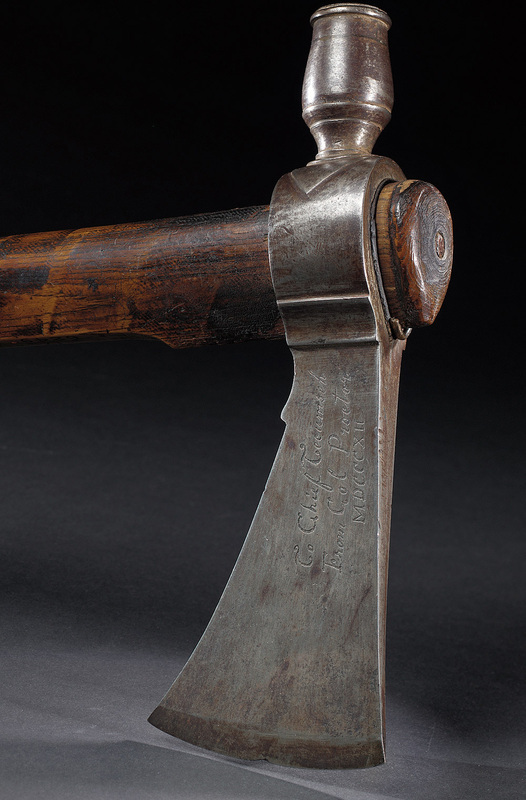 When there is no doubt as to a tomahawk's authenticity then there are more bidders willing to pay more money. Unfortunately there are no unbiased, scientifically accepted DNA type tests available to us to unequivocally determine a trade item's origin & age other than experienced opinion which can vary. Even some "experts" are fake. Below here is a nicely cast & polished reproduction of a Missouri War Axe made in India with pierced cut outs (sometimes just referred to as piercings) which has been and is available on the internet and reenactor catalogs. Most fakes are reproductions tweaked with rust, stain, dye and dirt. ....below here is what it looks like after it has been artificially aged with a handle that has been doctored with tar or black paint. Notice the exact same fluted grooves, 8 pointed stars, dotted outlines, shape, decorative notch, dimensions, etc as the previous one. 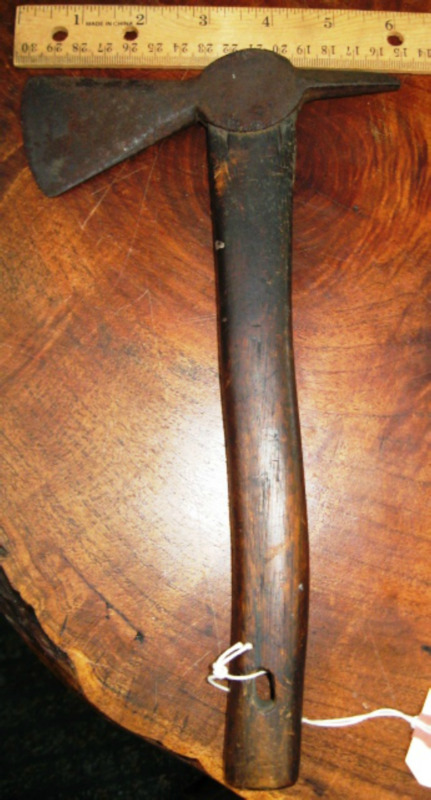 The blackening of the handle near the eye (see arrow) was meant to simulate the natural leaching of iron to bare wood contact over many years exposed to the weather. Notice the artificial leaching appears blotchy like it was applied here and there, and appears more like a surface coating rather than ferric oxide leaching out and soaking into the wood fibers. Look for signs of hand forging (lapping over of iron inside eye) or if it was drop forged or cast. Complete originals have been sold for up to $44,000 and far better fakes than this are out there. See pages 17-20, & 30 for more characteristics to watch out for and also my Ebay Guide. This next particular authentic pipe tomahawk is probably the most often photographed. It has many gold and silver inlays, multi-faceted bowl, ornately engraved on blade & inlays, and an ivory stem marked on the handle P.C. Angstadt-- Peter C. Angstadt II, a Pennsylvania rifle maker in Berks County, PA. It is believed to have been made about 1800 when he was at the peak of his craft. Angstadt lived from 1765-1815 although the faceted bowl style is thought to date to at least the late 18th C. The engraved 'F. Hoff' was the person it was presented to. 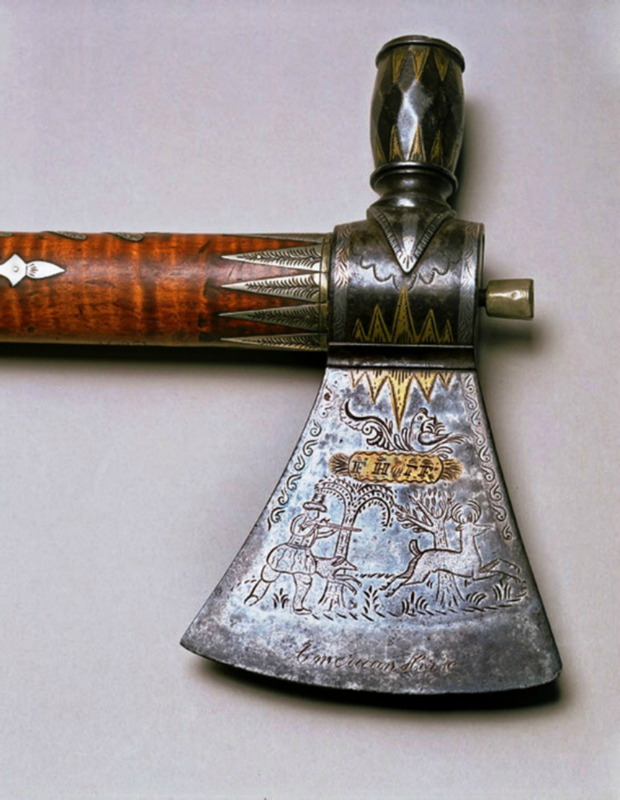 Pennsylvania/Kentucky rifle gunsmiths were already adroit at engraving, woodcarving, silversmithing, and forging so more than a few of them were employed to make these fancy pipe tomahawks as presentation pieces to Indian Chiefs. Even the curly maple haft matches their rifles. 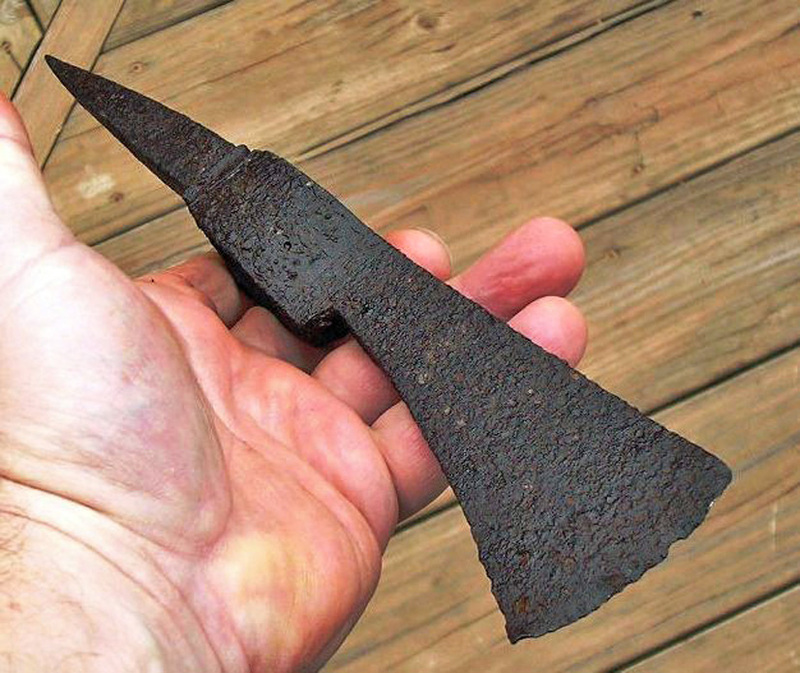 This beautiful spike tomahawk below was recently found by metal detector by Kevin Hughy of St. Ignace MI. near the old Fort Du Buade of the 1600's era. An identical example measuring 10.5" was found in the Winnipeg River in 1966 & can be seen on page 83 of "Voices From The Rapids; An Underwater Search for Fur Trade Artifacts 1960-63" by Robert C. Wheeler et al. Probably French made. The French seemed to make many trade items more robust than the British ones. To my fellow metal detector hunters & collectors, please tag your items with location of find, date found and whatever else you know about the location. Documentation makes it not only more valuable but it may help us date them or tell what tribe used them, and when, etc. Once that data is lost, it is lost forever. This pipe tomahawk is of the style of the American frontier smith J. Wilson with rocker engraving of leaves and flowers typical of his work with brass inlay. Circa 1850, collected from the Omaha Indians 1860. Notice it has been in a preserved collection for 150 years so oxidation is minimal. The head measures 8.5" long and is 23" overall in lenth. Similarly marked pipe tomahawks by this maker can be seen in American Indian Tomahawks, by Harold Peterson,1971, item 188, p. 118 and item 198, p. 120 and Tomahawks and Pipe Axes of the American Frontier by John Baldwin, 1995 pg 103. 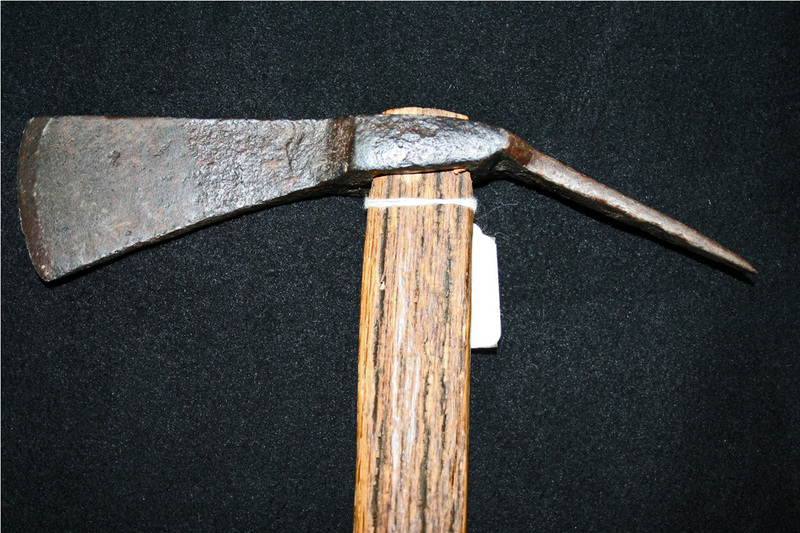 This pipe tomahawk above was said to have been used in the Whitman 'Massacre' in 1847 (although there is some dispute in that provenance). 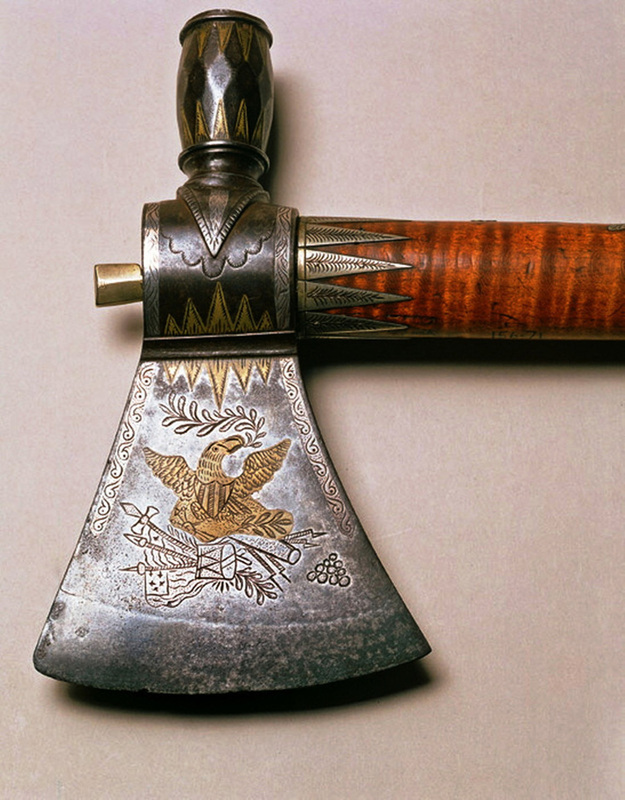 In 2005 the tomahawk was stolen from the Whitman Mission Museum near Wala Wala, Washington. In 2006 it was returned by mail anonomously with a note asking for forgiveness. The FBI is still investigating the theft. On November 29, 1847 14 white settlers & missionaries were killed by the Cayuse. Nobody seemed to know the exact reason for the attack at the time ...but then they never asked the Cayuse. There is another side to this story seldom told. 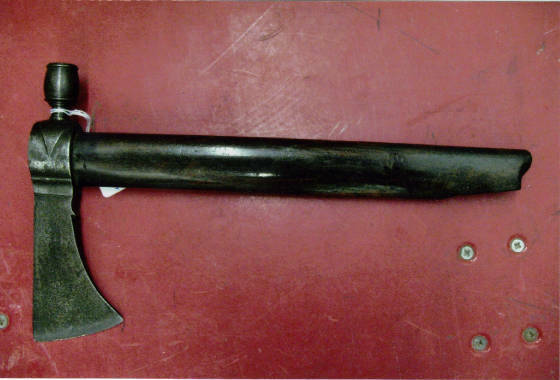 The next 2 images are of a very lightweight spike tomahawk that came from an Albany, NY. estate & also was unmarked & undocumented. It weighs a mere 7.6 ounces total, measures 10.5" in overall length, the head measures 6" x 2" overall. It has an elliptical eye & small square nails in the handle top. The hole at the bottom was probably for a leather thong that would wrap around the wrist so as not to lose it's grasp unless thrown. No fancy engravings, no filed notches, nor intricate inlays of silver--these weren't just a symbol of war-- they were the tools of war. 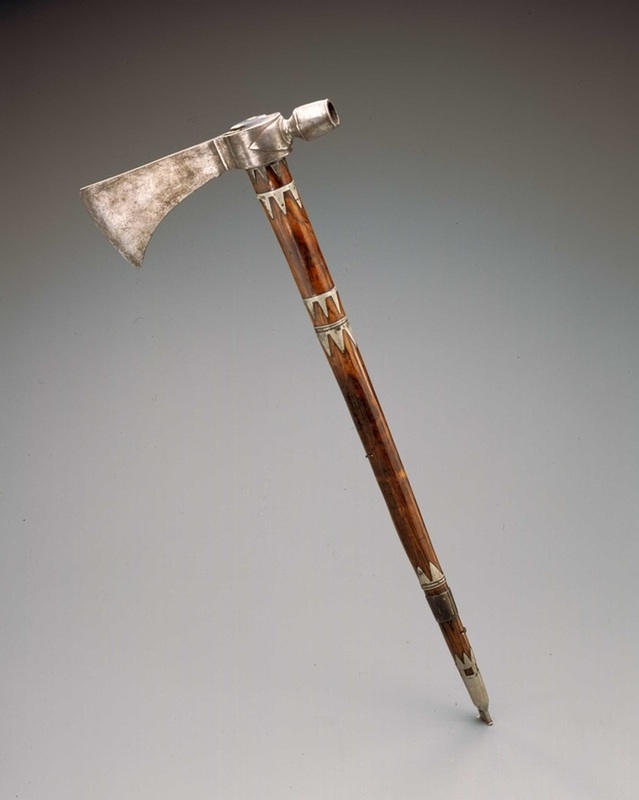 Pipe tomahawk presented to the Mohawk leader Joseph Brant (Thayendanegea), engraved with silver plate inscribed: "Given to my friend Joseph Brant from the Duke of Northumberland 1805". Brant died in November 24, 1807 so it was protected in a collection shortly thereafter. 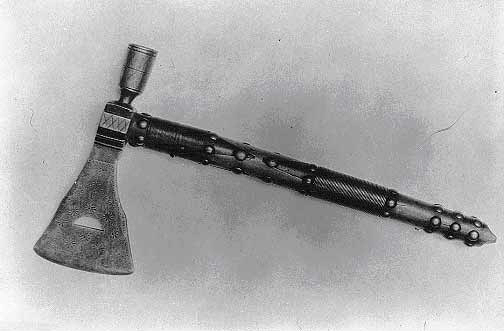 The following pipe tomahawk was presented to Tecumseh by the British. On the reverse is the classic bird with the "B E" on either side of it with sun moon & stars on the reverse side.